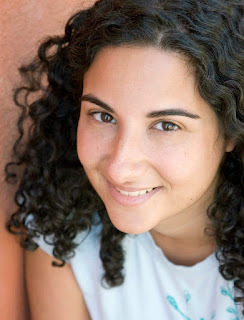 Two Chicks On Books: Blog Tour- WAX by Gina Damico An Interview & Giveaway! 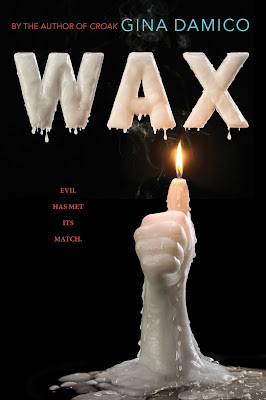 Blog Tour- WAX by Gina Damico An Interview & Giveaway! I am thrilled to be hosting a spot on blog tour for WAX by Gina Damico!!! I have an interview with Gina to share with you today! And make sure to enter the awesome giveaway for a hardcover of the book! Haven't heard of WAX? Check it out! Hi Gina! First I want to say welcome to Two Chicks on Books! WAX sounds absolutely fantastic and I can’t wait to read it! And am so happy that you could stop by for a visit! For the readers: can you tell us a little bit about WAX and the characters? very realistic wax sculptures – too realistic, as Poppy later finds out, when a teenage wax boy jumps out of her car trunk, naked. He doesn’t know anything about the world or how to be a person, yet Poppy inadvertently adopts him, and long with the rest of Poppy’s theater crew, they begin to discover that not all is well in their town. In fact, its residents are starting to look a little…waxy. It’s a standalone. My next book is called WASTE OF SPACE, and it is the story of teen teenagers picked to be stuffed into a rocket ship, shot into space, and have the entire debacle taped as a reality show for a morally challenged television network. What could go wrong? No, but the Grosholtz Candle Factory is inspired by the flagship store of a real-life candle company. I won’t say which, but suffice it to say that it’s gigantic, over-the-top, and has to be seen to be believed. It has a room that snows. IT SNOWS. IN THE ROOM. our cynical teen years. And I don’t have any least favorite characters to write – if I did, I wouldn’t write them. Evil characters are fun. Mwahaha. What is your favorite passage/scene in WAX? The description of the Grosholtz candle factory was a blast to write, mostly because all I got to be as outrageous as I wanted. If Willy Wonka designed a candle store, what would it look like? This. Some historical research was necessary, although I can’t say too much about that because it gets a bit spoilery. The really fun research had to do with wax itself – how candles are made, the chemistry of scents, how wax behaves when it burns, etc. Science forever! Waldo. He shares my love of travel. Grunt: The Curious Science of Humans at War, by Mary Roach. She writes about science with the best sense of humor I’ve ever read, and if you’ve never picked up any of her books you must do so immediately. Getting flung out, untethered, into the depths of space. Everyone laughed at this until Gravity came out and THE THREAT WAS PROVEN TO BE REAL. More of an album than one song: the original Broadway cast recording of Urinetown, since I was just in a local production of it. If you haven’t seen it, you must do so immediately. *googles fall 2016 movies* - let’s see, uh – Tyler Perry’s Boo! A Madea Halloween, and I’m looking forward to it because old timey movie marquees won’t have enough letters for the full title so they’re going to have to get creative. Rise to the challenge, movie nerds! Thanks so much Gina for answering my questions! I can’t wait for everyone to read WAX! 3 winners will receive a hardcover of WAX! US Only. Right up my alley and such a wicked cover I'd grab it off a shelf just because of that! Sounds like a cool read. I've read another of Gina's books and it was really good. I can't wait to read another! This sounds so creepy and fun, love the cover too. Thanks for the chance to win a copy. This sounds fun and creepy. Thanks for the giveaway! The ridiculousness of the storyline is established early in the book, and the writing makes it easy to just go with it. I really enjoyed the characters' frantic attempts to save their town, and didn't find myself questioning their efforts in such a crazy alternate reality.